Angel investors are well-heeled individuals who invest sizable chunks of their own money into a new business, in exchange for equity. Angels or informal investors can fill the gap between the “seed” capital the entrepreneur raises from personal networks (self, friends, family) and more conventional capital such as bank loans and venture capital which become available after the business hits its stride. Angel investors invest their own funds, rather than work through an organization that pools funds. Angels are not easy to find. (If you were one, would you want everyone to know?) So mostly they’re located through personal networks. There are few “social business angel networks” (SBANs) such as Investor’s Circle, Toniic, and ClearSo. 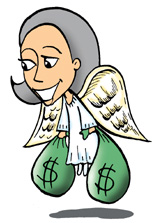 The downside of working with angel investors is that they usually expect very rates of return. Roughly half of all startups fail within five years, and only about 1/3 of those that survive are profitable. So, with those odds, angels look for young companies that have the potential to grow 20-30% per year, and then get sold within a few years. That’s tough for most social enterprises to offer (or accomplish) and still maintain their social commitment. Moreover, angels tend to watch over their investments, which seems reasonable enough at first but often reduces the entrepreneur’s authority and control. Do you really want someone else looking over your shoulder? Someone who might not get the social focus of your venture? Now, not all angel investors match this pattern. Some are willing to accept lower financial returns for social enterprises, and some have no interest in meddling in your venture. But don’t count on it. The next blog will look at venture capital as a source for financing.